The gyros - a Greek dish - is essentially a sandwich with a fillet of meat , traditionally pork, chicken or lamb, and outside Greece, particularly in the US, with beef & veal. It is cooked on a vertical rotisserie, and is usually warped in a flatbread - Pita - and garnished with tomato, onions, Kazantzakis sauce and french fries. Gyros have origins from the 'Donner kebab' a Turkish delight - which was first popularized by the Middle East immigrants in Athens. By the 1970's it had gained popularity in US - in the cities of Chicago & New York, and became integrated into the menus of many Diners and Quick Service Restaurants. The Gyro, being a popular sandwich ( meat dish wrapped in flatbread ), provides both, an ideal snack and a meal. If consumed as a meal, sides and add-on such as french fries or a beer drink would make it complete. As the cone cooks, juices from the meat are basted from the lower parts and fats are added on the rotisserie to make the meat moist and crisp. Finally, the pieces along with add-on such as tomatoes, onions, french fries or Kazantzakis sauce are warped in a flatbread - Pita - ( which is lightly grilled ) and served accordingly. The Gyro, being a popular sandwich ( meat dish wrapped in flatbread ), provides both, an ideal snack and a meal. If consumed as a meal, sides and add-on such as french fries or a soft drink would make it complete. Prominent display of the items on the menu board with graphics. Variants of Gyros may be prepared for the menu ie, pork, beef, veal , lamb or chicken. More the options presented, better will be the sales with customers coming back for more. 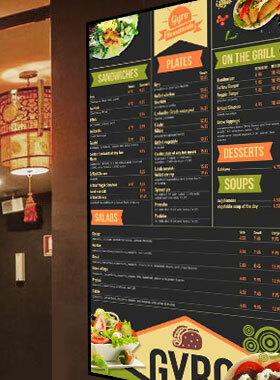 The illumination of the menu board, with bold & glittering contents should create the desired impact. Can be promoted as a snack as well as a meal item with add-on. A video presentation with a narrative on it's preparation will boost sales. The restaurateur can brand the Gyros with it's business eg Harry's Gyros, Gordon's Gyros - and present it on the menu board. Gyros could be presented suitably on picture frame menu boards as well, which will give it a distinctive feel and importance. Gyros could be accompanied or complimented by salads, sides & drinks and a combo pricing could be devised therein.